Just 82 miles north of our site in Brookings, we found the perfect spot to park for the next week: Robbin’s Nest RV Park. Our Robyn used to have a vendor’s license in Dayton for the name Robyn’s Nest…. 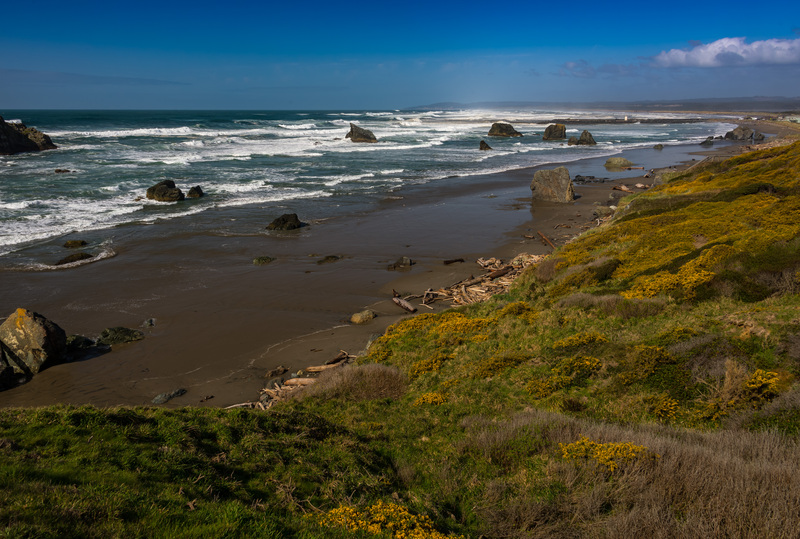 We’re outside Bandon, Oregon, a small town whose claim to fame seems to be its shoreline, and modest waterfront just as the Coquille River empties into the Big One. And tourists. A year ago, we passed through here and stopped at Face Rock Creamery. We’d heard raves about its herb mac and cheese, and about the size of its scoops of ice cream. They make their own cheeses and ice creams. Oh my, the herb mac and cheese is to die for, if you can even imagine! We won’t say anything more about the ice cream, because I’ve heard it said that gluttony is a sin…. Here’s a generalized shot of a small portion of the shoreline, taken from the high hilltop paved walk at the center of town. We’ll be down on the beach at a lower tide, getting up close and personal with some of the ocean-side features in the coming days. You have no idea how you brighten my days with your pics and messages! I’m bed-bound now. I’ve been to many of these places and they bring back lots of great memories! Thanks!!! How wonderful that we can be part of your life this way, Yvette! It’s great to have you along on our travels!